La Belle Époque restaurant in Fort-de-France, Martinique creates an elegant dining experience. Situated on a pretty street with fine examples of Creole architecture, La Belle Époque stands proud housed in a 100-year old Colonial house. Madame Martine Diacono purchased the house in 1983 and has created a graceful, charming restaurant where the menu is as sophisticated as the owner. 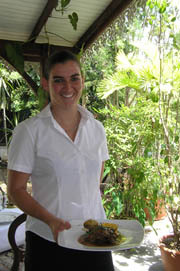 Talented young chef François Xavier Gayalin is responsible for the well-executed culinary creations. Edward F. Nesta and I had a gracious, leisurely lunch at La Belle Époque in April 2006, where the restaurant is an attractive reminder of the age of the house, from the ornate tile floors, wood ceiling fan, and period furniture that create a warm and inviting ambience. The dining room was lovingly set with shining crystal and china, and an antique sideboard held a treasured collection of old and vintage rums, but it was a perfect blue-sky day, and we decided to take advantage of dining on their patio in the garden where the air was gently perfumed from the ripe mangos on the trees. Sitting at a table dressed with a white damask tablecloth, with a brass lantern, enjoying the soft background music and tropical landscape, I felt like I was suspended in time. Sabrina, our waiter, brought us aperitifs of Möet et Chandon to accompany the delightful amuse bouche of a selection of puff pastry temptingly topped with foie gras, dates and tapenade as we perused the menu. We selected the three-course menu, and for his first course, Edward selected the Duo of Foie Gras, which consisted of generous rounds of foie gras sprinkled with sea salt and pink peppercorns served with toast points. 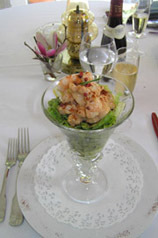 I selected the Cocktail Exotique de Crevettes, served in a footed coupe glass filled with succulent shrimp in a creamy sauce with pink peppercorns on a bed of mixed greens kissed with balsamic vinaigrette, and accompanied with crispy rolls still warm from the oven. Paired with a 2004 Les Teres Bleues Brouilly, Collin-Baurisset, 12.5% vol, Crèches-Sur-Saone, Beaujolais, our starters were perfect. For our second course, Edward selected the duck served in a rich sauce, with a twice-baked potato with a crispy golden top, and a delightfully rich yet light, "giromon" pumpkin flan. I selected the fish, served with a lemon sauce with chives and scallions, and accompanied with the twice-baked potato and "giromon" pumpkin flan. We each have our own view when it comes to desserts, and Edward ended his lunch with a decadent, sinfully rich chocolate torte with raspberry sauce and vanilla ice cream. I selected the lighter dessert of an assortment of green apple, raspberry with cassis sauce, pineapple, mango, and passion fruit sorbets attractively presented in a tuille pastry basket that was a tropical taste of Martinique. Afterward our lunch, Madame Diacono showed us her exceptional collection of Martinique rums, which include a 1929 vintage J. Bally rum, and a bottle of 1885 Saint James rum that was so dark with age that it was the color of steeped tea. We sampled a glass of Saint James Hors d'Age Rhum (very old) that was like an Armagnac, with an aromatic nose with fragrant orange notes. Since we appreciated the Hors d'Age, Madame Diacono insisted that we try a glass of the 1929 vintage rum from J. Bally. Rum producers like wine producers will create vintage rums when there is an excellent harvest. 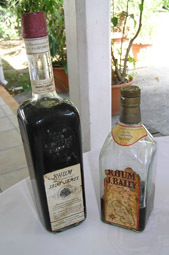 1929 was an exceptional year for rum, and the distilleries produced vintage rum that year. After the first sip of this incredible 1929 vintage rum, Edward captured the essence of the experience by stating, "The finish was as long as some fish tales." The aromas were heady and intoxicating with butterscotch notes and a long, memorable velvety finish. We savored every drop in our glasses of this truly exquisite rum, and ended our lunch at La Belle Époque very memorably. The food at La Belle Époque is a celebration of elegance and sophistication, and the charming owner Madame Diacono is a most welcoming hostess. Over the course of our lunch, I met with Chef Gayalin and convinced him to share a few of his recipes, which he graciously provides in the Chefs' Recipes section in English and in French. 97200 Fort de France, F.W.I. Read other articles on Martinique in Destinations section: Destination: Martinique - The Caribbean Side, Destination: Martinique - The Atlantic Side, and in the Hotels and Resorts, Restaurants, Spas, Chefs' Recipes, Fashion, Gastronomy, Events: Martinique Gardens, Events: Martinique Adventures and Liquor Cabinet sections. © October 2006. Luxury Experience. www.LuxuryExperience.com. All rights reserved.